Pamela Wood: "To me, the most important part of being an artist is the ability to give new life to a sometimes singular idea. As a book artist, I can add dimension to a written story. I can wrap a story with illustrations. I can create and adorn the vessel that encloses an idea…. Each final piece aesthetically communicates a sentiment to match the content of the story it contains. The work is alive, and it is a part of me." Tempe, Arizona: Artboard Ink, Ltd / Rarehare Creations, 2014. One-of-a-Kind. 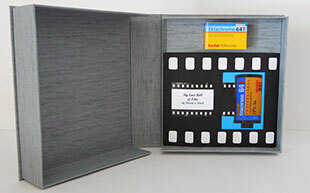 Sectioned 7.5 x 8.5 x 2" cloth-covered clamshell box with roll of film and book laid in. Kodak Ektachrome 64 T film in original box. 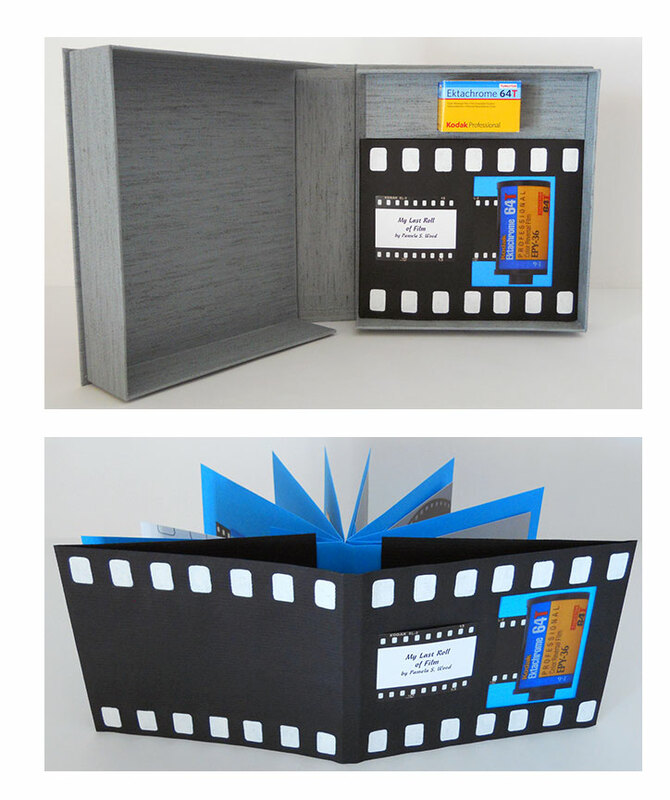 Book: 6.75 x 5.75", 18 pages; pocket book with adhesive cover. Materials: commercial papers, photos, paint, book cloth. Signed by the artist. Pamela Wood: "This book documents my personal struggle with leaving my film days, and the love of it. Finally facing digital photography as my friend. Change doesn't happen until we are painted into a corner." Tempe, Arizona: Artboard Ink, Ltd / Rarehare Creations, 2007. Edition of 3. 3 x 3 x .25"; opens to 6.25". Papers are commercial handmade paper plus cedar bark paper handmade by the artist (on edges and spine). 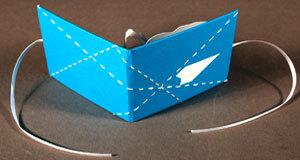 Pop-up and flaps to look and work like a box. Pamela Wood: "We spent many years moving. So our storeroom contained lots of boxes with unknown contents. After closing our storeroom in 2001, I had the chore of opening boxes of my past. I would see this book in my dreams. So I made the dream real with this book." Tempe, Arizona: Artboard Ink, Ltd / Rarehare Creations, 2007. Edition of 4. 4 x 5 x .75" closed; opens to 23". Accordion fold in which the pages of commercial white paper have cutout windows in which handcut paper garments hang from a string clothesline, attached by mini wooden clothespins. Commercial handmade paper cover with paper title-author label tipped on. 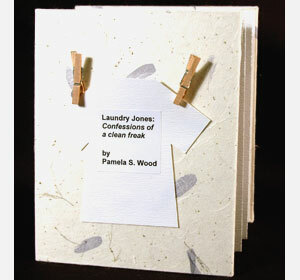 Pamela Wood: "I spent four days with no way to do laundry due to plumbing issues. So, this is a creative response about my laundry addiction." 2.125 x 2.375"closed, extends to 12". 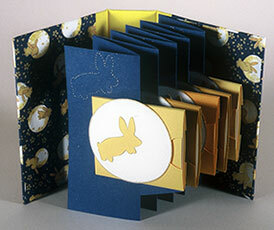 Miniature accordion book with 6 panels. Original color illustrations copied and tipped in. Cover and inside papers handmade by artist, tinted over beaten flax. 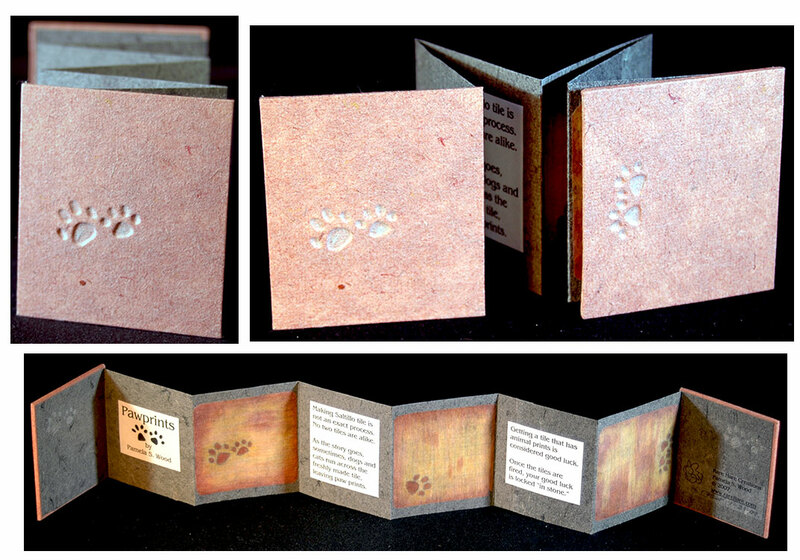 Debossed footprints on front and back covers. Signed and numbered by the artist. Pam Wood: "When I moved into our house in 2001 I had the flooring changed to Saltillo* throughout. 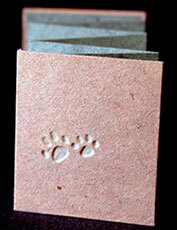 The tile setters shared some myths about the pawprints in the tile. I loved the thought and made this book as a memory." *Saltillo Tile is handcrafted from durable clay that only exists in the Mexican city of Saltillo, Coahuila. Supposedly no two tiles are identical. Handmade characteristics include marks such as an occasional dog print, chips, bumps, color variations. 6.75 x 5.75"; 14 pages. Pocket book with non-adhesive cover. Photos by the artist. Hand-dyed tyvek cover paper. Signed and numbered by the artist. 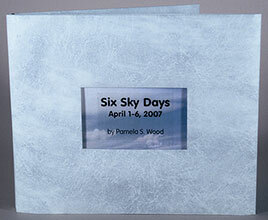 Pamela Wood: "I took photos of the Arizona sky for six consecutive days. April has some clouds but the common sky is cloudless. Thus proving Arizona is Big Sky Country." Tempe, Arizona: Artboard Ink, Ltd / Rarehare Creations, 2005. Edition of 6. 3 x 3.25" closed; opens 9.25" vertically. 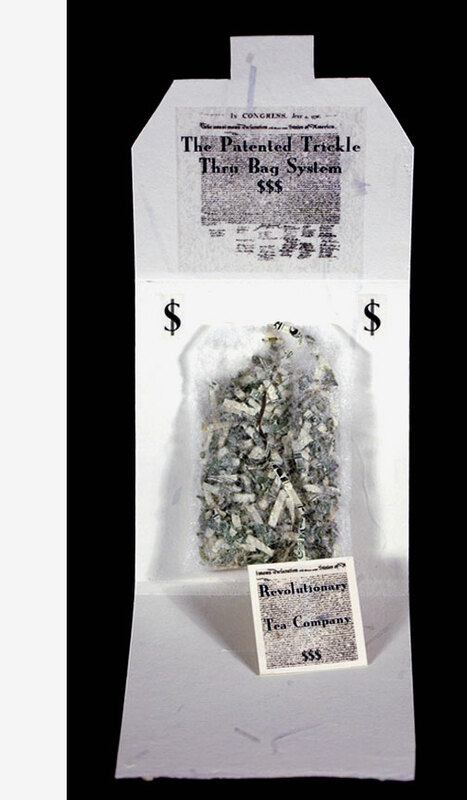 Handmade shredded US currency paper and copies of the Declaration of Independence. "Tea" bag constructed from fabric sizing material and sewn with silver thread. Pam Wood: "On the eve of W's re-election I was so mad. By the inauguration I came up with this book. The first two of these went to the Cranes Paper Museum. They sponsored a show of how money could be used in art, since Cranes makes the US currency paper. This is my most political statement in a long time. One of my favorites." Tempe, Arizona: Artboard Ink, Ltd / Rarehare Creations, 2004. 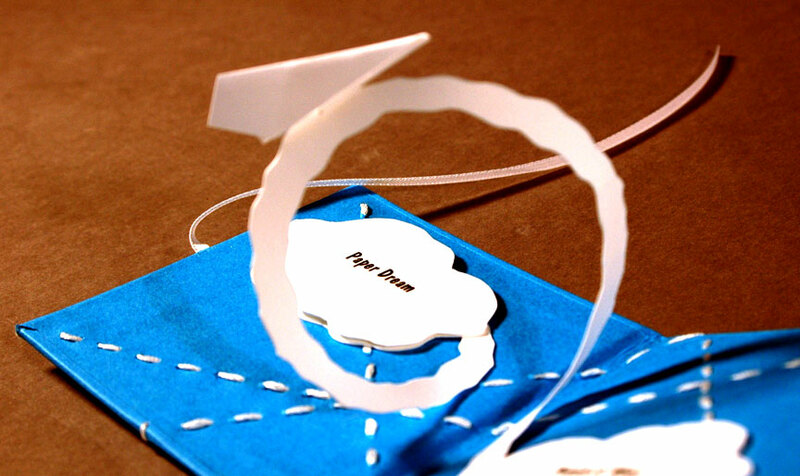 4 x 3.75" pop-up construction using commercial handmade papers and embroidery floss. The embroidery resembles the contrails from airplanes. Two clouds open up to reveal the story. Ribbon tie. A sheet of paper who thinks he [sic] can fly. With the help of the artist, he does. Pamela Wood: "As with flight, a dream takes passion to become reality. You gotta believe! " Tempe, Arizona: Artboard Ink, Ltd / Rarehare Creations, 2002. Edition of 2. 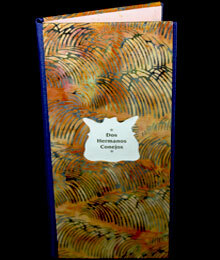 3.5 x 3.5 x .25"; opens to 16.8"; 5 concertina pages. 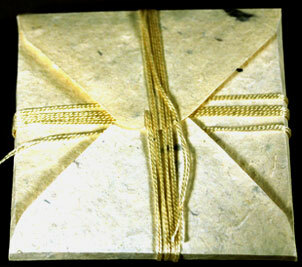 Handmade paper: abaca with silk inclusions. Sewn letters and sewn handmade envelopes. White embroidery floss closure. Pamela Wood: "This book was a response to my surgery in May of 2002. Major surgery is scary, but the removal of a part of one's anatomy that makes one feminine was troubling to me. Would I still be a woman? The envelope is only for me to know, are my private supplications at the time. The white was being tight, like "white knuckle" scared." 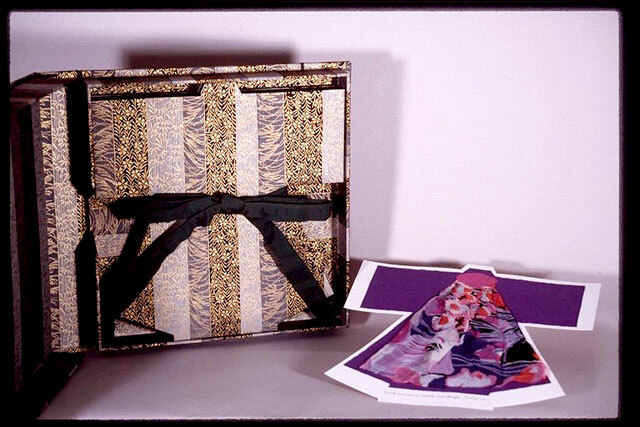 Edward H. Hutchins' review, "Finding Release in a Bound Book": Bound ... is experienced by unwinding turn after turn of white embroidery floss that secures the flaps of a portfolio made of creamy white, handmade abaca paper with kimono silk inclusions. 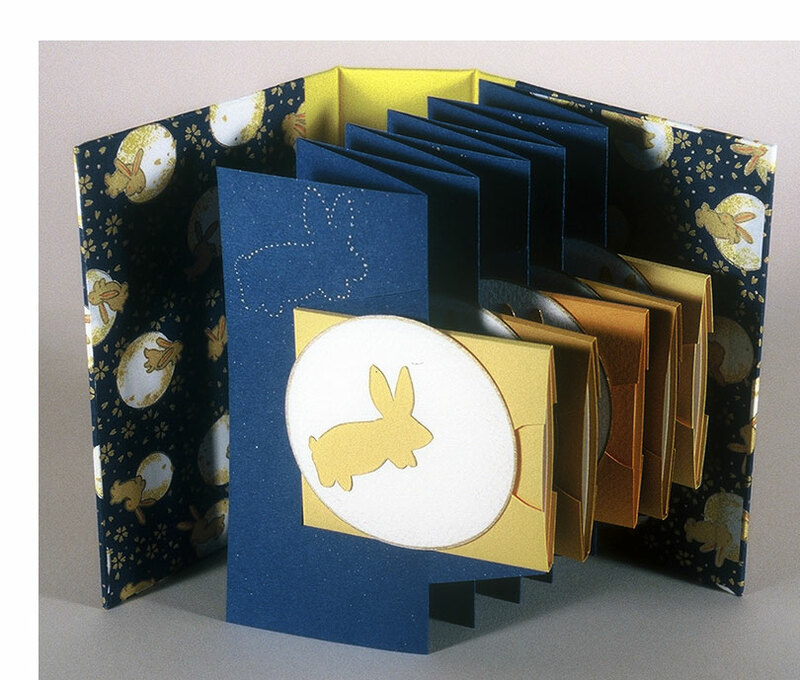 Inside, five concertina pages unfold and on each is a card with a stenciled letter from the title, as well as a miniature envelope, glued and sewn tightly to the page. The envelopes are bound so that their contents cannot be revealed without destroying the book." Tempe, Arizona: Artboard Ink, Ltd / Rarehare Creations, 2000. 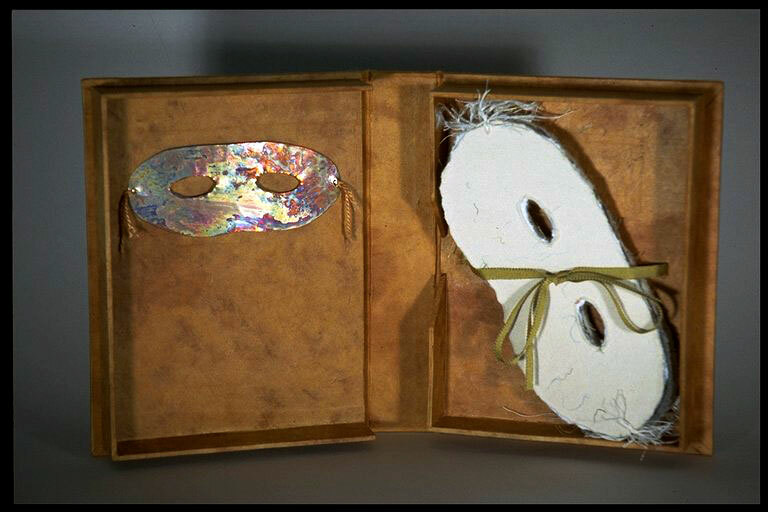 8 x 3.75"; 18 mask-shaped pages housed in 6.5 x 8.5 x 1.5" handmade clamshell box with a copper mask on the lid. Ribbon tie attached to bottom of interior lid to hold pages in place. 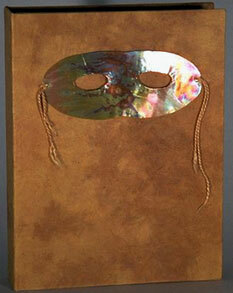 Copper mask decorates box lid interior. Art as suggestion. Eighteen masks of handmade paper provide the springboard for each viewer's imagination. Pam Wood: "I did a solo show about masks in 2000. This was one of the 3D pieces. I created it to be its own artifact. The viewer can make up where it came from. Viewers … smile as they mentally play with the 'mask' concept. Words were not necessary. All my handmade paper masks made the piece look even older. I used my kitchen stove to create the copper masks patinas." Tempe, Arizona: Artboard Ink, Ltd / Rarehare Creations, 1999. Edition of 2. 3.5 x 4.25; 12 pages. Accordion structure of commercial handmade paper. Other materials: clock face and hands, mirrors. 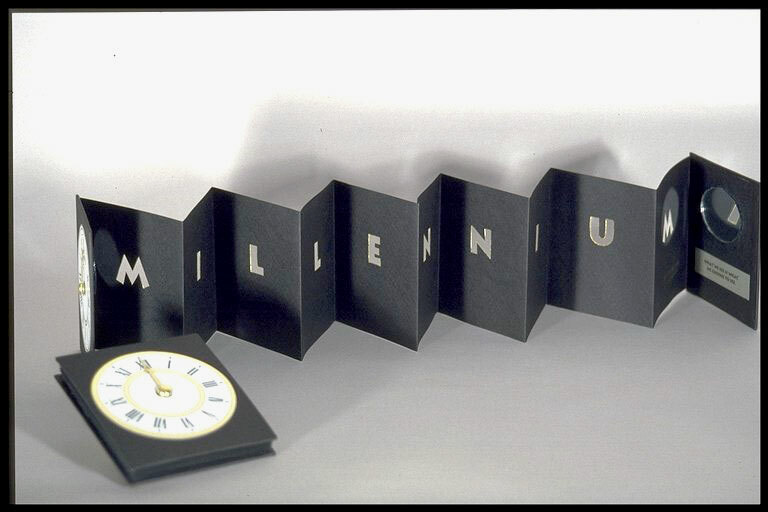 Pam Wood: "This piece was done for the pending Millennium at midnight 1999. I was inundated with all kinds of 'end of the world' garbage. I responded to calm myself down with what I feel is the truth about time. It's manmade. We choose to see what we want in the mirror. In this case it's the viewer." Tempe, Arizona: Artboard Ink, Ltd / Rarehare Creations, 1998. 4.5 x 6.375" accordion structure; extends to 36". Wood developed this book for a show on science. 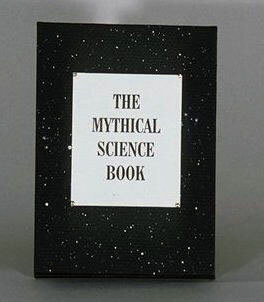 First came the idea of a "science book" then came the planets and then the mythical part. Pamela Wood: "I researched the planets names and the myths attached. I really enjoyed doing the color drawings. 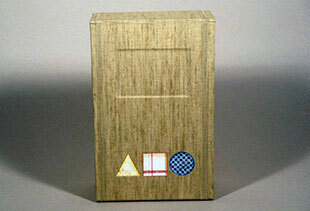 The gold foil was part of a process that used the laser heat to transfer it to the black toner. I had to stop using it, the laser repair guy was rather miffed at me, as was my husband. Harmony prevailed, no more gold transfer. "I have always been fond of this book, simple as it is." "My books contain my own drawings and writing. I use designs that I have engineered to convey the best use of space for my specific idea. 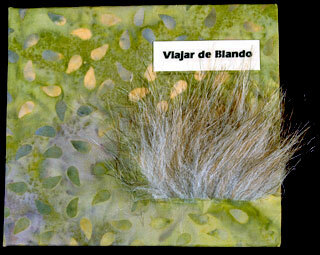 I combine many materials and commercial papers, as well as my own handmade papers. I use either hand lettering or laser printing. The choice depends upon which expresses my idea best. I then develop a mockup of the book for placement. 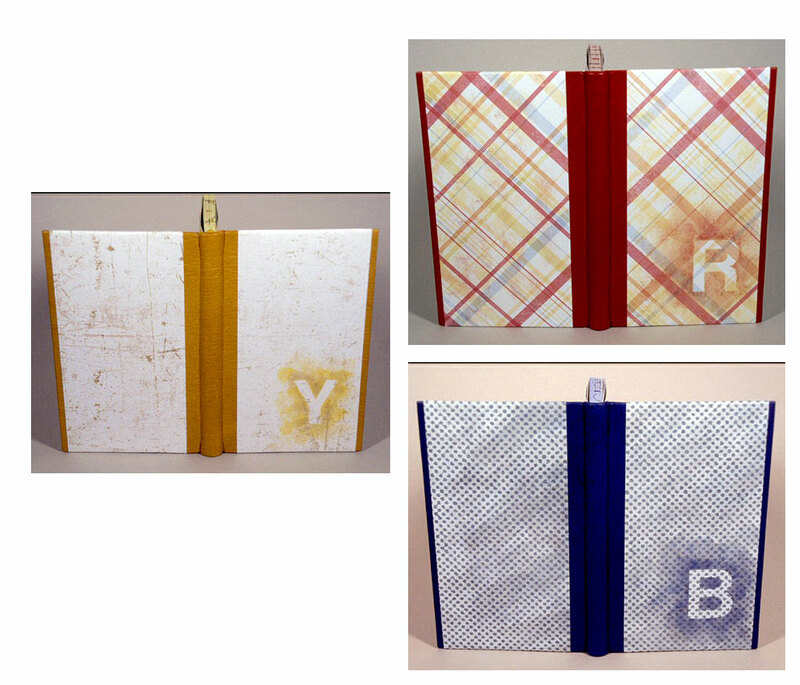 After this, I proceed to use my bookbinding skills of covering the boards, gluing, folding, and sewing the final piece." Wood has a special affinity for furry animals. Tempe, Arizona: Artboard Ink, Ltd / Rarehare Creations, 2008. Edition of 4. 6.25 x 4.75" closed; 5 accordion folds. Materials: Japanese yuzen chiyogami, Canson mi-teintes, 18 karat gold ink, bookcloth. Five 3 x 2.75" pamphlet stitched books in boxes. Bound in hand-dyed bookcloth by the artist. Signed and numbered by the artist. Pamela Wood: "I retell the myth of how the rabbit got on the moon. The story is in five parts pulling out of five window boxes. The design is based on Hedi Kyle panorama box. The story and design work together for added visual interest." Tempe, Arizona: Artboard Ink, Ltd / Rarehare Creations, 2003. 3.5 x 4.5"closed, opens to 6 .5". Shaped like a magician's black hat. Original drawing, velour paper, silk ribbon. Boards and drawing handcut. 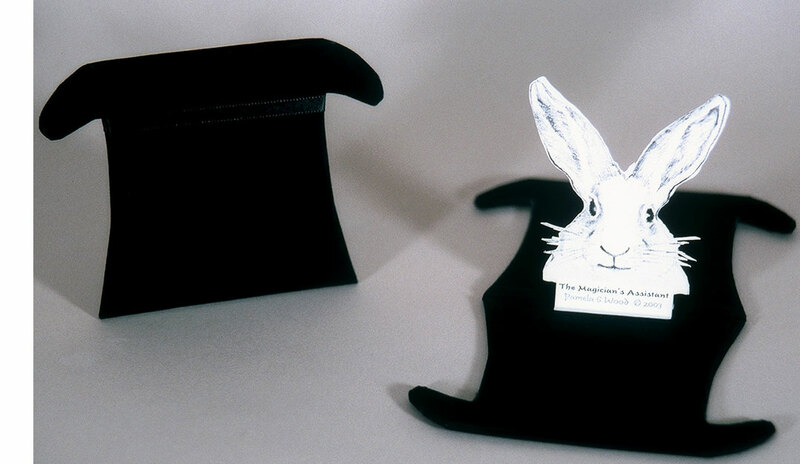 "The piece itself is a two-dimensional hat, obviously a magician's stovepipe, or opera, hat, exquisitely shaped in black felt with a black satin band. There are no directions on the further course of action by the viewer, but it is fairly obvious that the part of the hat originally intended for one's noggin can be opened, and the other end of the hat is a practical hinge in order to perform that operation. At first try it is somewhat difficult to pry the hat open because the velcro mechanism which keeps it closed is so deftly constructed. But, with a little extra effort it can be done. "The fact that it requires effort to open the hat is an intimidating factor because one does not want to damage the beautifully made object by being too clumsy and overbearing; the mind and mood of the viewer has now been preset (intimidation / submission) for what is to come...."
3 x 4", opens to 12"; 5 pages. 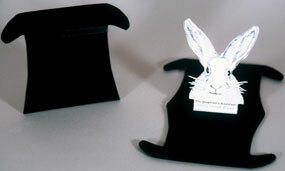 Suede-covered rabbit-shaped boards. 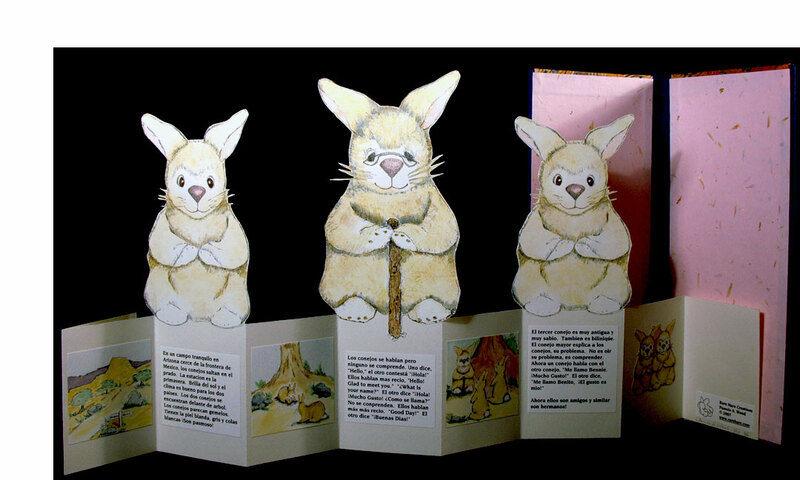 Illustrated with official postage stamps for the Year of the Rabbit. Pam Wood: "This is a wonderful story about how the Zodiac signs were selected by Buddha. I love rabbits and am born under the rabbit sign. It is a wonderful mix - story and personal. I was playing with how to make an accordion more exciting and wanted the soft of a rabbit without rabbit fur. Just a fun book." 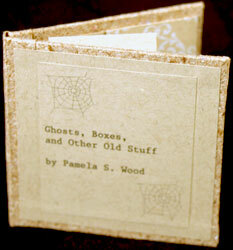 Fine bindings by Pamela Wood. Tempe, Arizona: Artboard Ink, Ltd / Rarehare Creations, 2011. 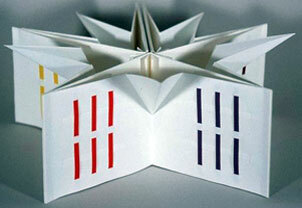 Intersections: 7.125 x 4.375 x 6.25"; 54 pages. Hand colored. Bound in full leather, French technique, sewn endbands, leather hinges. Leather inlays on cover. In cloth-covered clamshell box with paper title on spine. Signed and dated by the artist. Line: 7.125 x 4.75 x 6.25"; 54 pages. Typewriter. Full leather technique, top edge painting, sewn endbands, leather hinges. Leather inlays on cover. In cloth-covered clamshell box with paper title on spine. Signed and dated by the artist. Pam Wood: "'Line and Intersections' are a two volume set inspired by my ongoing love and exploration of the Bauhaus movement. The 1920's and the Bauhaus movement enjoyed the luxury of a new devise, the typewriter, which I used to create the one-of-a-kind texts for both books." Tempe, Arizona: Artboard Ink, Ltd / Rarehare Creations, 2010. One-of-a-kind. 5 x 7.75 x 2.75" cloth enclosure holding three volumes. Each volume 4.5 x 7.25 x 6.625"; 46 pages. Half leather case binding with leather fore-edges and leather hinges. Handpainted top edge and handsewn endbands. Original decorated cover papers. 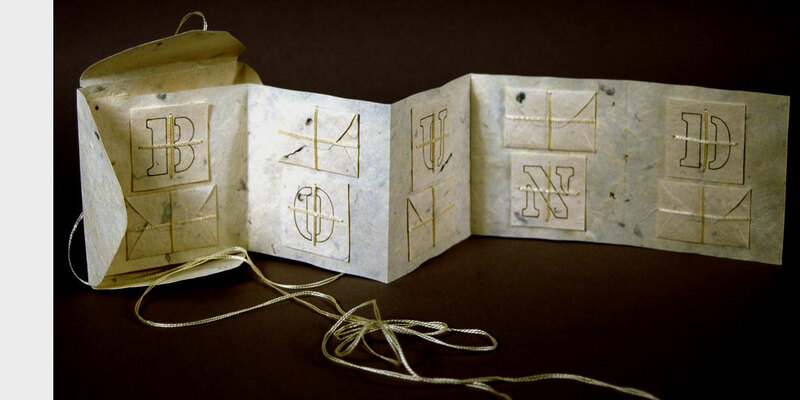 Handmade paper endsheets with original decoration. Text, coloring, and typing by artist. Signed and dated by the artist. Pamela Wood: "As a lover of the Bauhaus movement, I set out to create three original texts by hand with the new instrument of the 1920's, the typewriter. I wanted the concept of color and text to enhance each other. The yellow triangle, red circle, and blue square are based on a specific color principle taught at the Bauhaus school by Wassily Kandinsky. Using this color theory, I created this compendium. "Bauhaus is about common sense and order, not extravagance." "The relationship of colour to form was of central significance to Kandinsky’s thinking. The Bauhaus’s characteristic assignment of the three primary colours red, yellow and blue to the square, triangle, and circle was based on a survey that Kandinsky carried out at the Bauhaus Weimar. ..."
In 1993 Wood took Spanish lessons. Out of this experience came several books. 4 x 9.25 x .5", opens to 18"; 8 pages. 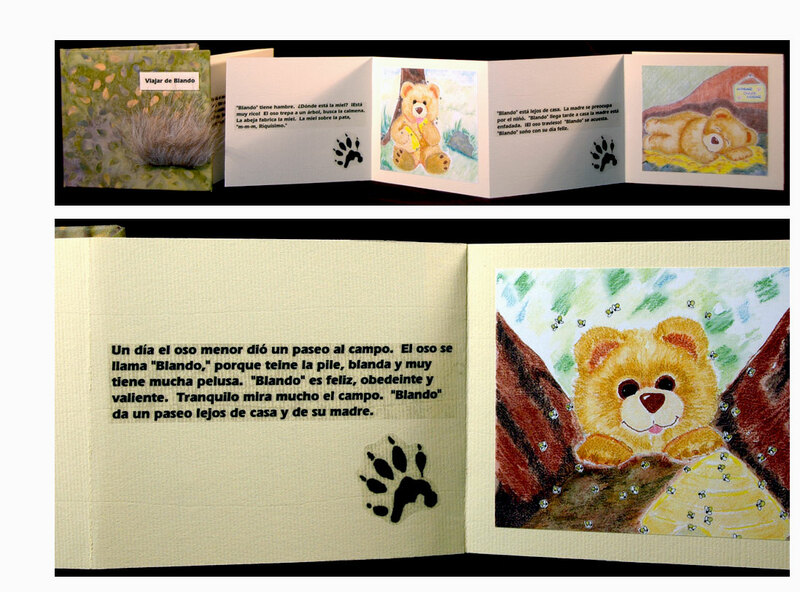 Casebound accordion pop-up with cut out illustrations. Handpainted original illustrations. Text in Spanish. Bound in original bookcloth. Pamela Wood: "This story is spoken through two identical looking rabbits on the Arizona-Mexico border. They prove that we are not as different as we think we are. Despite language barriers, we can communicate, which results in friendship. The rabbits are like brothers. "This is an extremely personal story, my second in Spanish. Everything about this story is dear. It took me two months to create this book, and many years to get the courage to create it at all. I love rabbits and these three are very special. I guess a part of my soul is in this book." 4.25 x 3.75" closed, opens to 33"; 8 pages. Printed on commercial handmade paper. Original illustrations reduced from watercolors by artist. Accordion fold structure bound in front pastedown. Bound in original bookcloth with synthetic fur embellishment. Tipped-on paper title label. Text in Spanish. Pamela Wood: "Blando, the bear cub, wanders off on his own for the day. His big adventure has him finding his own lunch, and home again. Tired, he dreams of his day on his own. "In 1993 my husband and I took Spanish lessons. As an assignment I created this story using the words and tenses we were learning at that time. After much editing I enlarged the story to what it is now. I decided to create my own book to keep it very special to me. I really enjoyed this happy ,,, creation." 3 x 3"; 10 pages. 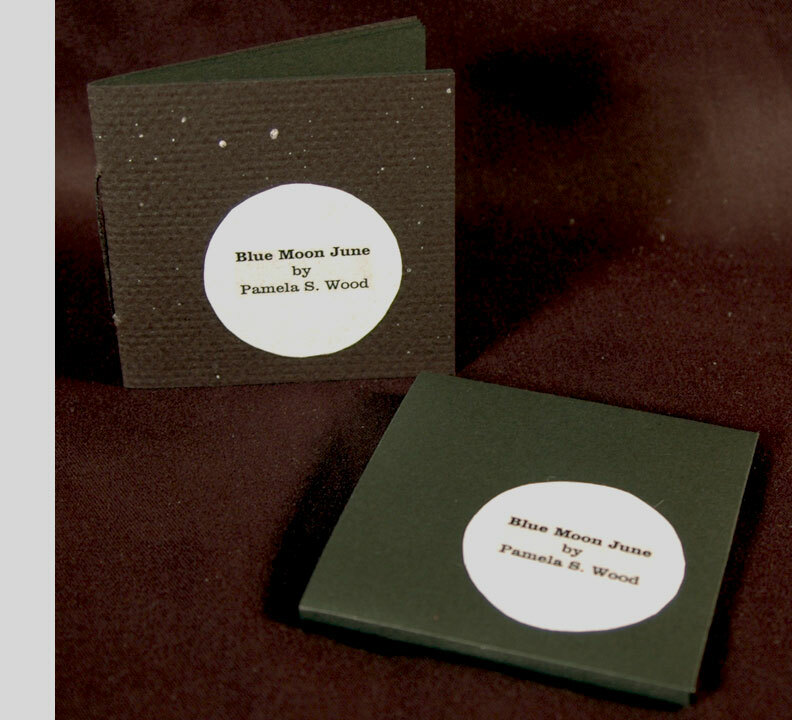 Pamphlet-style miniature on commercial handmade paper in matching black-paper slipcase. Text and original illustrations tipped in. 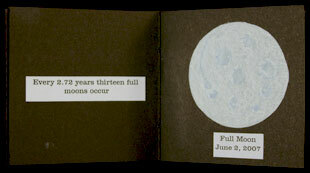 Pamela Wood: "June in 2007 had 2 full moons. I looked up the history of this event. I loved the story and myth, so I created this book about the Blue Moon June." Tempe, Arizona: Artboard Ink, Ltd / Rarehare Creations, 1997. 6.5 x 4". 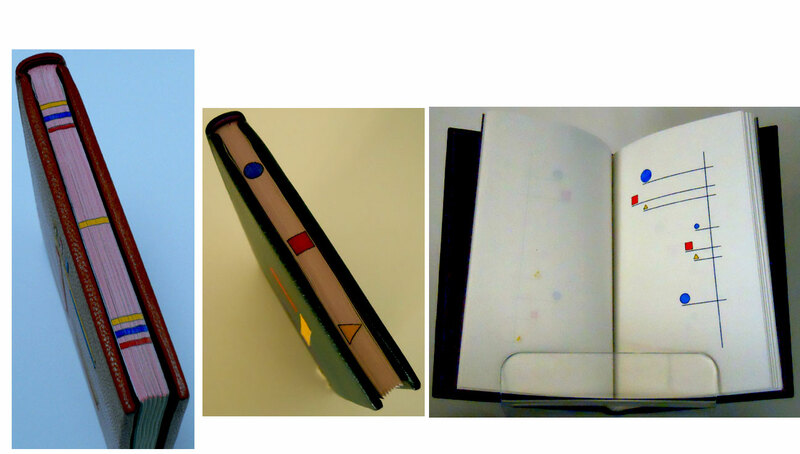 Star binding with a sewn non-adhesive spine and a glued fore-edge. Folded paper spacers in the spine area. Woven color strips on each page. Strips are hand painted on water color paper. Pages of wove made paper. Laid paper for the covers and the supporting boards between the star points. 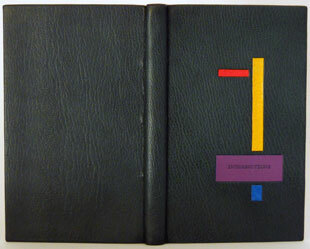 This edition of 10 books is based upon Josef Albers' Interaction of Color. 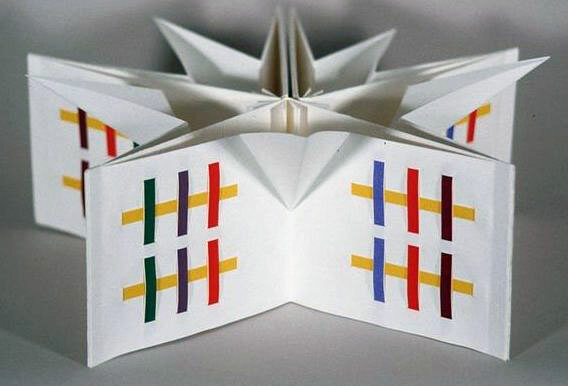 From review by Joe D'Ambrosio in Artists' Books Reviews, 2001: "In the weaving of the colored papers, Pamela Wood chose to use the same horizontal color on every page because the eye needs constancy to read a line of type. By training itself on a distinctly colored horizontal line on ever page of text, it is as if the eye is being told what to do—and it does what it is directed to do. It is interesting that the horizontal color is not the same in each book of the edition. This tells me that the color is not as important as the fact that it remains the same throughout that particular book. The vertical colors vary and thus become the fabric of the story simply by their being where they are....The woven colors reflect communication through which imagery suggests emotion and mood." Pamela Wood: "In 1997 I was invited to show at the Interchurch Center Gallery at Columbia University in NYC. I had done a series of two-dimensional work on the Albers' color theory. 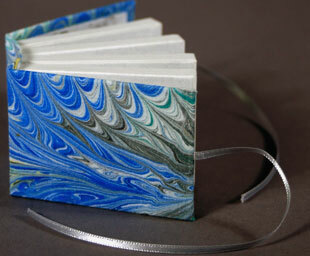 I added these 10 sculptural artists' books." 7.5 x 5.75" closed; 12" extended; one double page spread. Pop-up. Original bookcloth created by the artist. Ribbon closure. 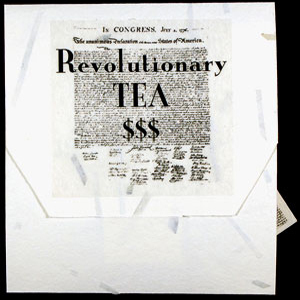 Pamela Wood: "My interpretation of Tea. High tea is precise and has many traditions. I tried to include as many visuals as possible. 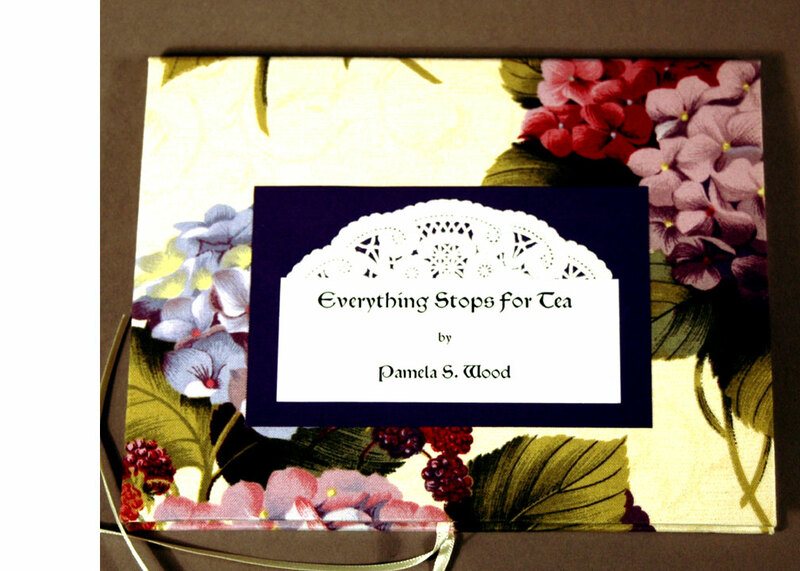 Floral tablecloths, lace doilies … tea bags and steam. One [text block] contains a run-on sentence of every kind of tea I could find. 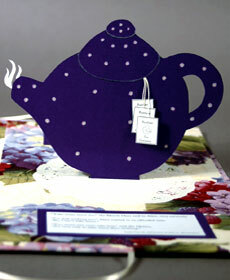 The second has some tea quotes from Alice in Wonderland, the most famous story with tea as a focus." Tempe, Arizona: Artboard Ink, Ltd / Rarehare Creations, 1996. Edition of 2. 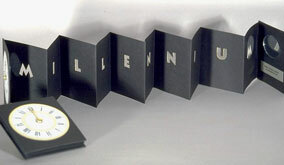 4 x 5.5", six page accordion-fold structure. Covers of colored papers over boards. Four cartridge caps protrude from the front cover. Text printed on paper made with shredded dollar-bill inclusions. 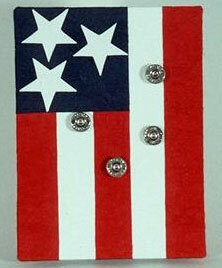 Large white stars holding confetti-like shredded dollar bills on front and back pastedowns. Joe D'Ambrosio, Artists' Books Reviews,: "Pam was present on the campus of Kent State University on that fateful day, May 4th, 1970, when the National Guard fired on and killed unarmed anti-war students. Pam, as an innocent student bystander, found it difficult to come to terms with the fact that representatives of the country she loved could so brutally treat displays of the First Amendment. To make matters more heinous, the entire student body received no direction other than to leave immediately under personal threat of bodily harm. Pam has had to live with this trauma for many years, and in 1996 expressed herself for the first time. Her husband took her to a firing range, so for the first time she could fire a gun and obtain the shell caps necessary for the visual expression of what burned within her heart for so many years. Her faith and trust in her beloved country had been betrayed. "The Fourth at What Cost begins with an image of the US flag, a horizontal display with stripes down and stars up. The red, white, and blue papers are crinkled to produce an illusion of movement. The pledge of allegiance runs across the bottom half of the text pages with comments from prominent figures of history interspersed with Pam's account of Kent State." Tempe, Arizona: Artboard Ink, Ltd-Rarehare Creations, 2002. Edition of 2. 2 x 3 x 2"; opens to 6" diameter carousel. Ribbon tie. Five box leaves. Original drawing inside. Original marbled bookcloth. Pamela Wood: "This book was my response to September 11th. I was stunned with the amounts of dust. As a papermaker I was even more shocked with the vast quantities of paper. 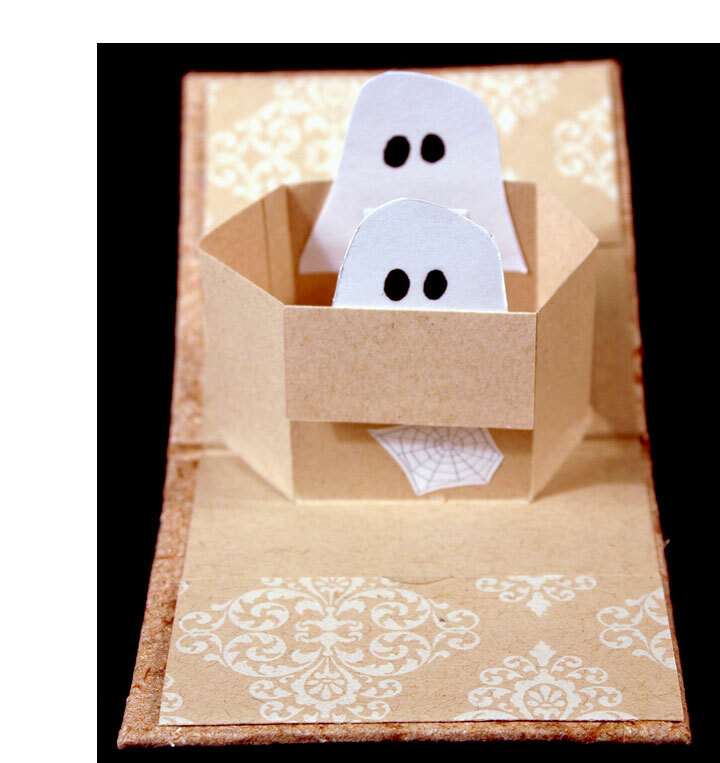 Each box contains tiny loose sheets of paper that move when the box moves."